Mix eggs slightly. Combine with ham, onion and pepper. Cook the same as you would any omelette. First, melt a Tablespoon of butter in medium frying pan over medium heat and saute the onion and green pepper until tender. Add the ham pieces. Add the beaten egg. As the egg starts to set, left the edges of the omelette with a spatula so uncooked egg flows under to get cooked. When almost completely set, fold the omelet in half. Turn off the heat. Let the omelette set one minute before serving so the inside cooks through. 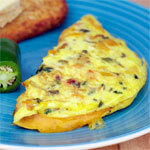 If desired, you could place 1/4 cup of shredded cheese over 1/2 of the omelette before folding. 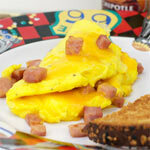 Or use 2 overlapping pieces of American cheese for a mid-America greasy spoon diner style Western Omelette. 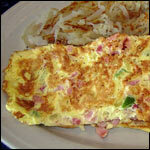 The classic combination of diced ham, onion and green pepper in a folded omelette. If desired, fill or top with your favorite shredded or sliced cheese. What do you think of Western Omelette? Also good as a patty on hamburger bun with mayo. It was nice. Thanks for the recipe. I made a Spicy Western Omelette by adding 1/4 of chopped jalapeno in with the onions and bell pepper and then I put shredded Pepper Jack Cheese in the middle. I'd recommend it especially if you like spicy foods. We loved this recipe. Thanks. Add a little sharp cheese to the mixture and it's so good. We make a version of this, except we also add diced tomatoes:) Very yummy. How is this not a Denver omelette? Although, the picture shows browning which I don't think an omelette should ever have. Although, I have met some people who prefer it that way. This recipe is so good. Simple, but superb. Even though I live on the east coast. It's the best omelette all around! 5 out of 5! 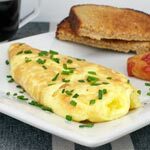 Finish the directions like this and it turns out great: flip omelet over when almost set, place a slice of American cheese on one side, fold and serve. 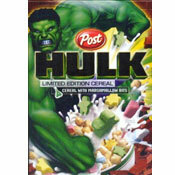 Its better with egg white... yum! One year later, and I still find it very enjoyable. This was very good. I loved it. I have to say, "it was very delicious." We call this a Spanish omlette, never the less, very good. Thos. I made it for me and my dad... and I love it! I didn't add any onions but I added cheese and it tasted good. Exactly what I was looking for... GREAT! This recipe is so good! I love it! I served it for breakfast, lunch, and dinner! Thanks! I was so hard to look this recipe. 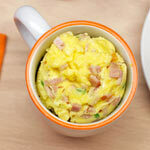 This kind of omelet is so good... my husband likes it. Thank you!